The term Gamekeeper’s Thumb is used when referring to an ulnar collateral injury caused by repetitive stress on the thumb during such activities as using a wrench, twisting electrical cords or wringing out heavy cloths. The term Skier’s Thumb is commonly used when there is an acute, forceful abduction of the thumb as when a skier falls without letting go of the ski pole. 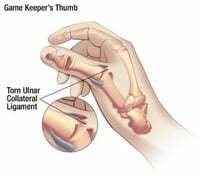 The injury may also be the result of falling on an outstretched thumb or catching a ball with an outstretched thumb. 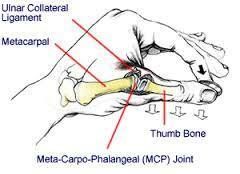 The thumb metacarpal phalangeal (MP) joint has a collateral ligament at the radial and ulnar aspect of the joint which provides stability for static lateral pinch. The ulnar collateral ligament (UCL) is susceptible to injury when radial deviation and hyperextension force is applied to the MP joint. The “classic” acute Skier’s thumb occurs when the thumb is forcefully abducted and hyperextended by the pole during a fall. Gamekeeper's thumb is differentiated from Skier’s Thumb as a chronic, repetitive stress condition caused by resistive grasping and twisting activities that stretch or tear the UCL over time.